Think you can cook recipes with whey protein powder like it's flour? Guess again. Learn the secrets! Many people who want to try baking or cooking with whey protein powder think they can treat it the same way they do flour. Newsflash! You can't. You have to always account for protein powder's uniqueness and cook it on its own terms. This is the case with most proteins (pea protein powder is its own beast), but it's particularly critical with whey. Otherwise, whatever you're making can turn out rubbery, extremely dry, and, well, pretty much terrible. The first time I made a protein muffin, I followed a recipe I found online. It called for three egg whites and one scoop of whey, to be stuck in a mug and microwaved for a minute. While the muffin tasted more or less okay, chewing it was like chewing on a rubber sole. Result: A bland and ultra-rubbery pancake that soured my taste buds and broke my heart. My second abject failure made me want to give up on ever cooking or baking with protein powder again. 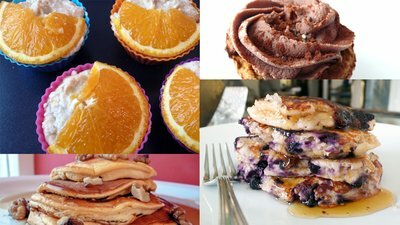 You will find a lot of recipes online for protein muffins and pancakes that, like the above, are like eating a tire. It doesn't have to be this way, though. You can work with protein powder to create incredibly fluffy and moist pancakes. You can use it to make soft, moist, and delicious protein muffins—muffins that people will actually like. There are four rules you must know to successfully cook with whey. Master them, and become master of the protein universe. You may use these rules to bake cakes as well but, for now, let's stick to pancakes and muffins. Never bake or panfry a batter that is more than a quarter protein powder. This is because, naturally, whey has a tendency to go dry and rubbery. You must always use what I call a primary moisturizer. This can be cottage cheese, pumpkin puree, Greek yogurt, or a cooked sweet potato. It can also be fruits such as applesauce, apples, bananas, or berries. You always need to have a type of flour in your batter. This will combine with your whey and give volume to your final product. My favorite flours to use are coconut flour, almond flour, oat flour, amaranth flour, chickpea flour, buckwheat flour, or quinoa flour. These are all excellent gluten-free, high-protein, and high-fiber flours. Always use a binding substance like egg whites, whole eggs, or a combination of both. Otherwise the finished product can be chalky and crumbly. By following the above rules, you'll be able to make anything and everything with protein powder, from cakes and muffins to pancakes and breads! The more you play with it, the more delicious variations of your protein powder favorites will result. You can add nuts, seeds, and any additional powders (e.g. cocoa, maca powder, lucuma powder), spices (e.g. cinnamon, cloves, ginger), and flavorings (e.g. vanilla extract, orange peel, almond essence) to your batter, too. You can also take advantage of the different flavors of protein powder that are available to keep your recipes simple but flavorful. For instance, if you're using vanilla protein, you can skip adding sweetener and vanilla extract to the recipe, since those flavors are built into the protein. The sky is the limit to what you can make once you understand the basics of protein powder cooking! Experiment with your combinations. Find out what you like and don't like. Combine lemon peel with poppy seeds, cinnamon with vanilla, cocoa with passion fruit! Try exotic ingredients. Be creative with your flavorings and remember to always build on what you learn along the "whey." These muffins are so good they'll make you want to break dance! (Or at least learn how.) I'll never tire of singing the praises of vanilla and orange—it's a combination made on Mount Olympus! The recipe calls for quark, a dairy product popular in Europe. If you can't find it near you, substitute Greek yogurt. These chocolatey, pumpkin-packed muffins explode in your mouth. Their super-moist texture and great nutritional profile make them a yummy, healthy treat. Keep them on hand for on-the-go breakfasts or post-workout snacks. Bring some to the office for a happy surprise. Ooh la la! What's not to love about protein powder pancakes? If you haven't tried to make them yet, this recipe is a perfect first effort. These pancakes are bursting with blueberries and fruity deliciousness! Throwing "never say never" to the wind, I confidently declare that you will never tire of this protein pancake. For a twist, try substituting peanut butter protein powder and sprinkling chocolate chips on top.